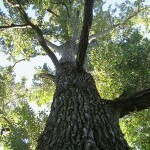 This giant black cottonwood stands near the site of the Willamette Mission established by Reverend Jason Lee in 1834. At that time, the Mission and tree were located on the banks of the Willamette River. The great flood of 1861 changed the river course to its present channel, leaving what is now Mission Lake. 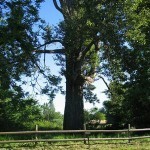 The Willamette Mission Cottonwood is the largest of its kind in Oregon and the nation. 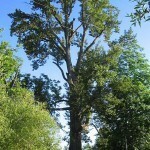 The tree is located in Willamette Mission State Park on Wheatland Ferry Road.